"How could you not tell your own brother what you do? 'I'm a spy!' 'You know, you should keep that quiet.' 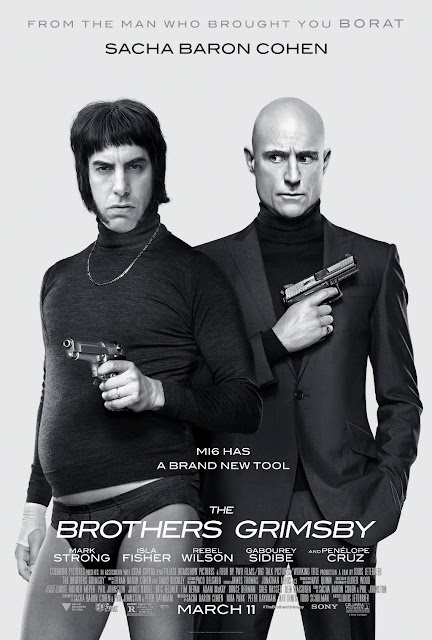 " That's a part of a hilarious conversation between Sacha Baron Cohen & Mark Strong in The Brothers Grimsby, a hilarious film, but somewhat of a disappointment. Cohen plays Nobby Butcher, a soccer-loving idiot from the poor English port town of Grimsby. He lives with his wife, Dawn (played by Rebel Wilson), & his 11 children. But he has always tried to find his long-lost brother, Sebastian (played by Mark Strong). 28 years ago, after the death of their parents, they were separated; Sebastian was adopted, while Nobby stayed in the group home. After his friend tells him that he found his brother, Nobby goes out to find him. However, Sebastian is an MI6 agent, sent to look for a potential assassin at an event for actress/philanthropist Rhonda George (played by Penelope Cruz), who is trying to cure the world. Just after she introduces a young Israeli-Palestinian boy with AIDS, Sebastian finds a target: Pavel Lukashenko (played by Scott Adkins), using a camera to trigger the gun. However, right when Sebastian is about to shoot the camera, Nobby sneaks up & gives Sebastian a hug, causing Sebastian to accidentally shoot the boy with AIDS, & his infected blood flies into the mouth of actor Daniel Radcliffe, infecting him with HIV. Also, the camera gun kills the leader of the World Health Organization. Sebastian is now considered to have gone rogue, & even though he is very furious at Nobby, he is now forced to team with him to clear his name, which leads to them uncovering a very big sinister plot. The film was funny at best, & mediocre at worst. It did get too serious at times, & I do not really care for serious moments in extremely light-hearted comedies. Cohen & Strong were hilarious at parts. Overall, the film is hilarious, & although it definitely pales in comparison to Cohen's previous films, such as 2006's Borat: Cultural Leanings of America for Make Benefit Glorious Nation of Kazakhstan, or 2009's Bruno, it still has some moments to laugh at.